Lace dresses are back in vogue. Lace bridal dresses are proving really popular again – look at Pippa Middleton’s recent choice. If you looked at a lot of her wedding guests, you will have noticed lace dresses were the top choice for many of them too. And of course, if you flick through the history books, the Royals like Queen Victoria loved their lace frills, sleeves and headpieces. So rest assured – lace is no longer dowdy or just for old ladies. If the Royals are rocking it, then why can’t you? The great thing about lace is it’s the perfect fabric for special occasions. Mothers of the bride are loving standalone special occasion lace dresses from designers such as Cabotine. These Spanish-inspired styles cover your arms with no need for a jacket. The lace is cool and comfortable too. With the popularity of vintage-themed weddings, lace dresses like those by Dress Code are the perfect look. They provide vintage glamour with on-trend styling. They can also complement a lace wedding gown beautifully so mum and daughter will look fab together. If you are not a fan of full-on lace, why not go for an outfit that only has a little bit of lace detail on it? This can suggest vintage glamour without being over the top. Many mother of the bride dresses like those by John Charles have pretty lace sleeves or necklines trimmed with lace. These are beautiful when you take the jacket off so you can go through to the evening part of the wedding with no need to change. Lace frock coats by designers such as Dress Code and Cabotine are also proving a big hit this season. The lace is light and easy to wear. This offers summer mothers of the bride the chance to wear a frock coat without overheating. 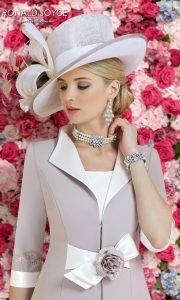 More mature brides are loving this look as it makes them feel bridal yet still dressed age-appropriate. So take a fresh look at lace. You no longer have to look like a doily or worse still, like you’ve nabbed your neighbour’s curtains! South Coast Weddings are wedding planners based in Bournemouth and offer wedding planning packages across Dorset and Hampshire.